Many NCAA men’s basketball teams would have a difficult time getting up for an NIT Tournament game, but the Stanford Cardinals appeared to have no such problem prior to their semi-final match-up with Massachusetts, thanks to some help from Ray Lewis. 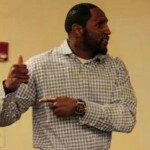 The Baltimore Raves linebacker has developed a reputation for delivering some of the greatest motivational speeches in sports, and he added another to his resume on Tuesday night. During the speech, Lewis asked the Cardinals players to be “pissed off for greatness” while refusing to be okay with mediocrity, and they obeyed his orders, beating UMass by a score of 74-64 and earning themselves a spot in tonight’s final against Minnesota. All I have to say is whoever plans on giving the Cardinals their pregame speech prior to tonight’s contest has an awfully tough act to follow.